F. solani f. sp. 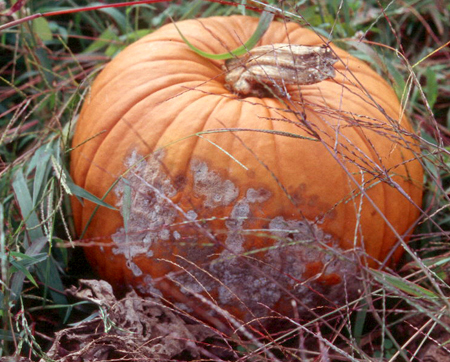 cucurbitae causes vascular wilt, crown rot and fruit rot of squash and pumpkins. The pathogen exhibits host specificity and exists as races (pathovars). Symptoms of the disease can vary with plant age, host, environmental conditions, amount of pathogen in the soil, and the aggressiveness of the pathogen strains. The first symptom noticed is often wilting of the leaves and within several days, the entire plant wilts and dies. A very distinctive necrotic rot of the crown and upper taproot is evident. Reproductive structures give the stem near the soil line a white to pink color. Fruits are attacked at the soil line and the amount of fruit rot is directly related to soil moisture. Surfaces of fruit that are in contact with the soil develop tan to brown, firm, dry and sunken lesions. Lesions may occur in concentric rings and remain firm unless invaded by secondary organisms. F. solani f.sp. cucurbitae is borne in and on seed and survives as chlamydospores in the soil for 2-3 years. Plants and fruits of any age can be affected. Crown and fruit rot is primarily a problem on squash and pumpkin and can severely affect the quality of fruit. Fusarium solani f. sp. cucurbitae, infects the crown and root tissues of seedlings and older plants causing water-soaked lesions near or below the soil line on crowns and upper roots. 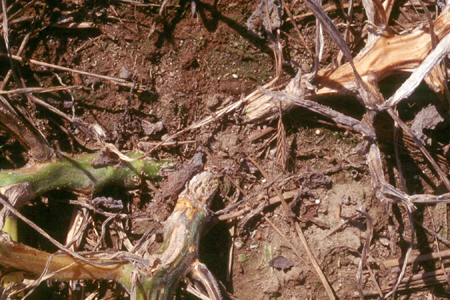 Lesions may darken, girdle the plants and cause wilt and plant death. As the disease develops, wilt may affect all leaves and shoots, plants become stunted, and suffer from poor growth. Leaves eventually become necrotic and dry up, and vines collapse and die. Infected plants grow poorly and may collapse. Plant resistant cultivars. Because pathogens exist in numerous races, knowledge of the prevailing races is needed. Rotate out of cucurbits for 4 years. Start with certified, disease-free seed. Avoid moving contaminated soil by equipment or water. Soil fumigation is initially effective, but soils are quickly recolonized. Fungicide treated seed will reduce disease incidence.